For as long as we can remember, we have been taught of the different types of flowcharts, and the different ways of using them. We know that by definition, a flowchart is a visual representation of how processes ‘flow’ by sequence. Other than flowcharts, there are other types of charts which include bar charts, pie charts, line charts, among others. Each of them effectively displays a set of information regarding different topics, through the use of lines, shapes, graphic symbols and other kinds visuals. 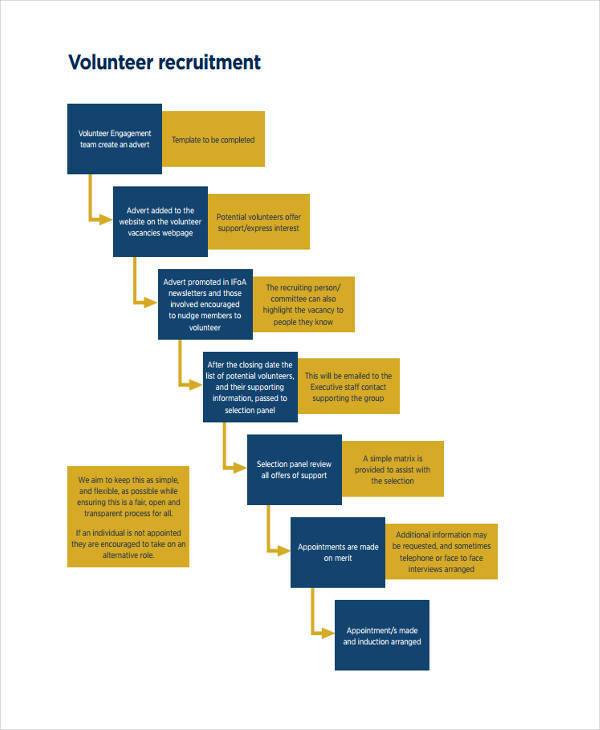 What Is a Recruitment Flowchart? Recruitment is the act or process of adding (recruiting) individuals as new members of a group or an organization. 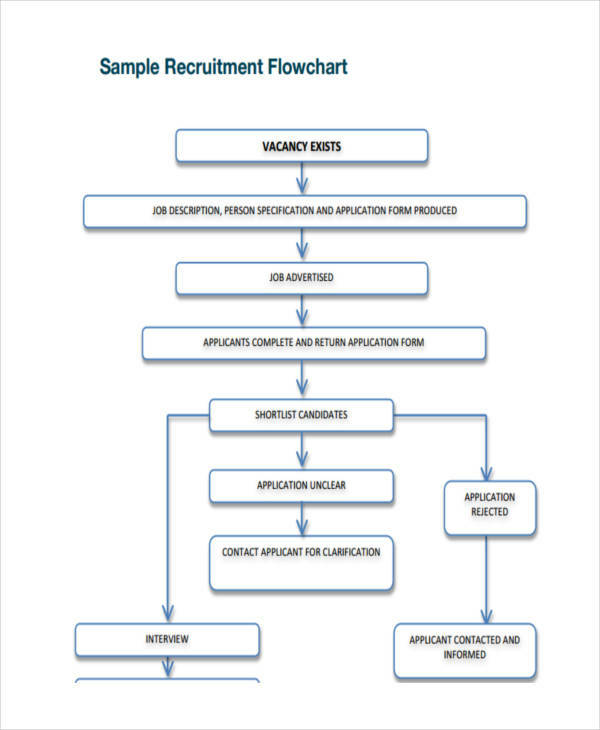 A recruitment flowchart displays the sequence of steps to be followed during a recruitment process. 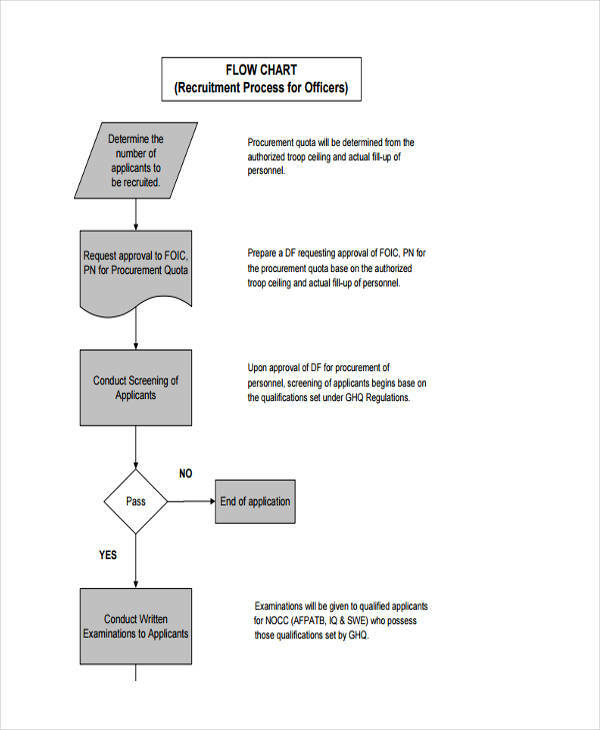 Basically, recruitment flowcharts provide guidance to both the recruiting committee and the new recruits, and simplify the complex recruitment process. It is essential to understand the whole process thoroughly, and recruitment flowcharts are just effective tools for this process flowchart. 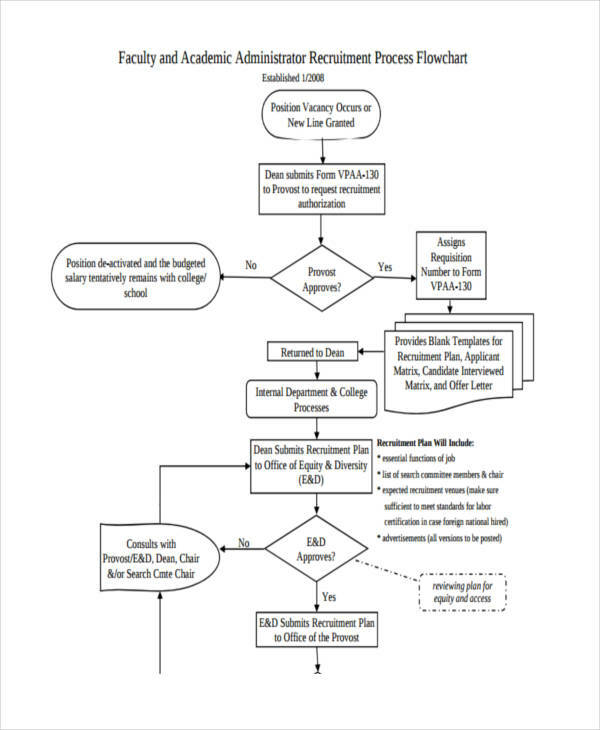 You might want to refer to some flowchart examples found in this source, for further clarification. 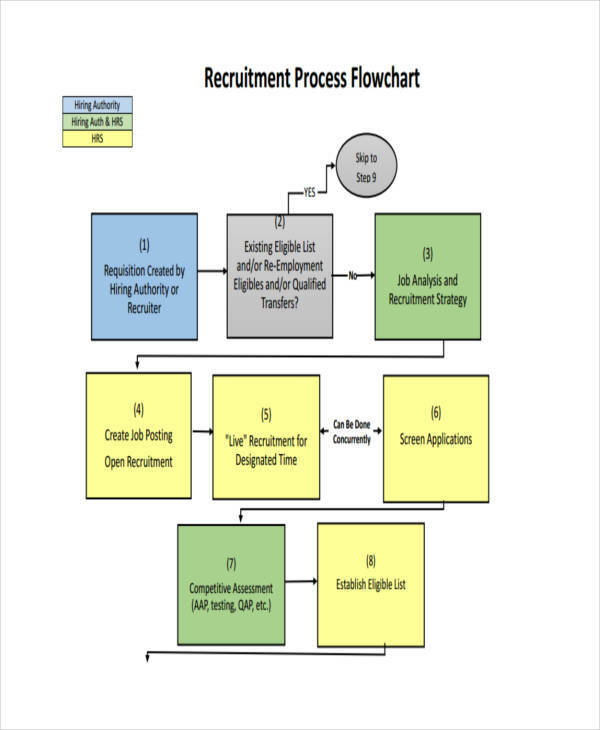 Recruitment flowcharts map the recruitment process, allowing the recruitment process proceed smoothly. 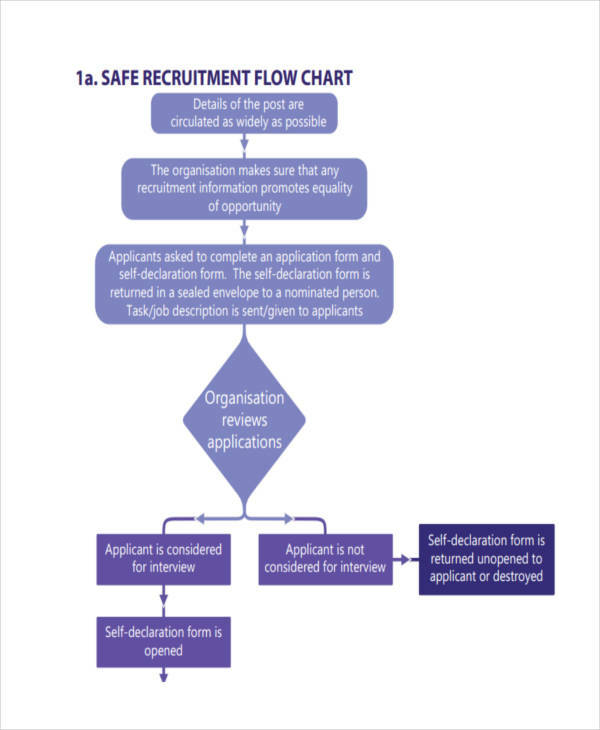 Recruitment flowcharts help in avoiding confusion during the recruitment process. Recruitment flowcharts bridge the communication gap between the recruiting committee and the people subjected by the recruitment. 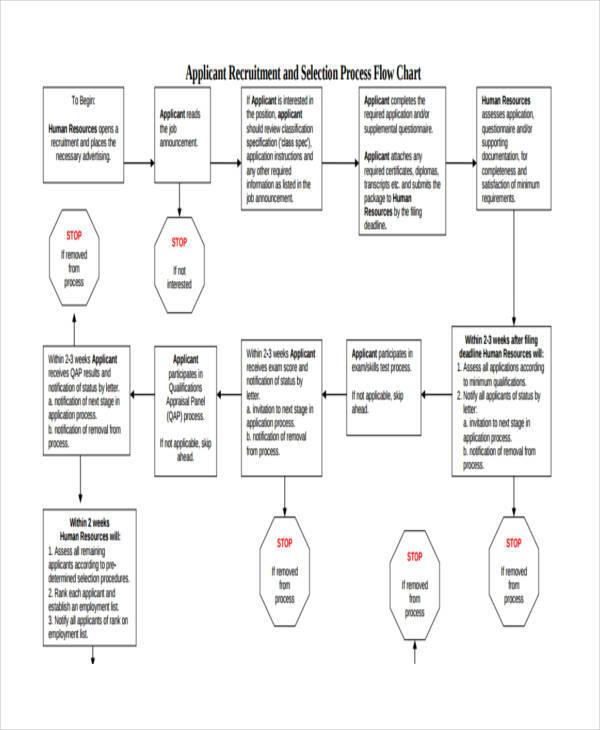 Recruitment flowcharts simplify the instructions and descriptions of the processes. Recruitment flowcharts give the readers more time to work on the process, since they are easy to follow. Recruitment flowcharts can be easily modified and improved for the better. You may be burdened by the thought of creating a recruitment flowchart, but believe me, there is an easy process to do that: know the basics. You have to have a purpose ans a goal examples. Having a purpose makes one more motivated. Having a goal makes one want to strive harder in order to attain such goal. Devise the processes to follow. Arrange them in sequence, and organize them properly. Write simply, so that your readers won’t have a hard time understanding what you have written. Learn to use symbols and colors. Different symbols can indicate different categories (if any). Different colors indicate the same thing. Learn to use these to your advantage. Consistency, still. You need to be consistent in using symbols and colors in order to avoid confusion in the part of your readers. Make sure your flowchart appeals to the eyes of your readers. As I always say, keep it simple, still. Ask for assistance. If you find it hard to do it on your own, ask for help. Learn about new ways to improve your recruitment flowchart as you go.